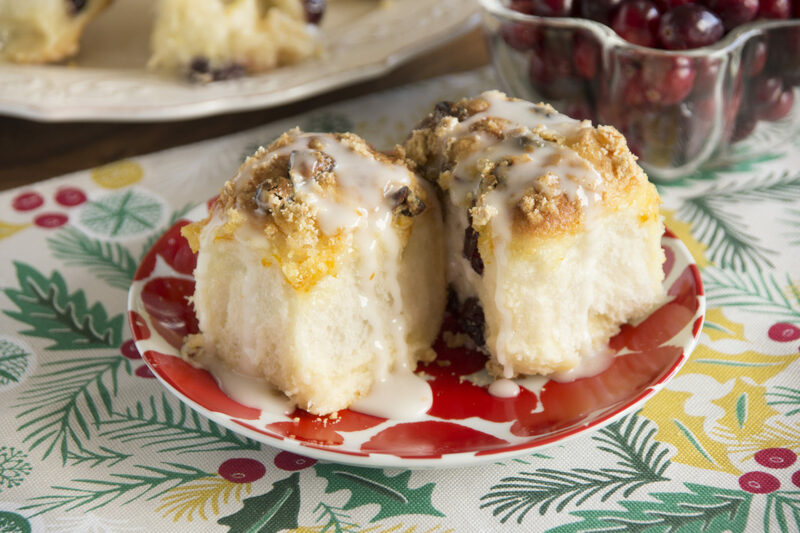 Cranberries and orange juice make these rolls a delightful addition for your next luncheon. Press about 1 teaspoon cranberries into each thawed roll. Place rolls in a 9×13-inch sprayed baking pan. Combine the butter, 1/2 cup sugar, cream cheese, and orange juice. Blend well and pour over the rolls. Cover with sprayed plastic wrap and let rise until double in size. Combine 1/2 cup sugar, the rinds and any remaining cranberries. Remove wrap and sprinkle the mixture over the risen rolls. Bake immediately in preheated 350°F oven 30-40 minutes or until rolls in center are done. Cover with foil last 10-15 minutes to prevent over browning.